The best ways to visit Gaudí's wonderful garden! A Gaudí garden city in Barcelona, respectful of nature, full of symbols of Catalonia and Christianity: A major work of modernism ! 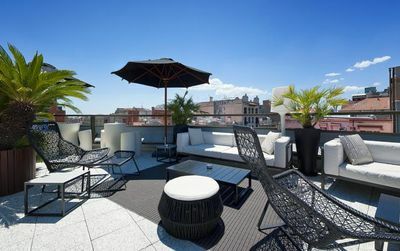 A terrace with undulating mosaic benches offering an unforgettable view of Barcelona, the famous salamander, two modernist pavilions, an extraordinary garden. The Park Güell is one of the most mythical places in Barcelona. The masterpiece of architect Antoni Gaudí is one of the city's tourist attractions, but only part of the 17-hectare park is freely accessible. Since 2013 the visit of the part built by Gaudi is indeed payable. Knowing that visitors have limited space for their well-being, it is important to book your Park Guell ticket in advance to avoid wasting time on the day of the visit or, more foolishly, losing the day. This is the object of this page which proposes you the best tickets to comfortably discover a monument inscribed on the UNESCO World Heritage List.. Which Park Güell Tickets? Our 4 formulas! Whichever formula you choose, be aware that you will have to choose in advance a date and time for your visit to the park. Before the hour is not the time and after the hour is no longer the time. The guards are quite inflexible on this point. Tickets purchased in advance allow you to enter the Park during the 30 minutes following the reserved time slot. All the tickets that we offer you are skip the line tickets, i.e. you will not waste time in any queues at the entrance to the site. These entrance tickets are 100% mobile, either to print or to keep in your mobile phone. Last entrance one hour before closing time. 1/ Barcelona City Pass: Combined skip the line Park Güell tickets + Sagrada Familia skip the line tickets + Tourist Bus + Airport Transfer + 20% discount..
Would you like to visit the Park Güell but also the Sagrada Familia and discover the city by tourist bus? 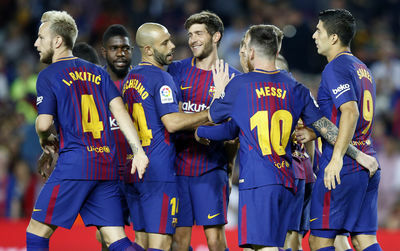 With this combined ticket, created by Barcelona.com, you benefit from one or two full days to discover the city by tourist bus. The bus uses three paths and offers 45 stops in front of the main sights. You get on and off the bus as often as you want, at your own pace. A wonderful way to discover the city's attractions. The blue line - interconnected at 5 points with the other lines - drops you off near the Parc Guell and in front of the Sagrada Familia! No more complexity to get to Park Güell - by public transport! The visit of the Park Güell: You visit without wasting time at the entrance the so-called "monumental" zone built by Antoni Gaudí: the modernist pavilions the entrance and the Guard's house, the Monumental Staircase, the 86 inclined columns of the Hall, the gardens of Austria, the Nature Square and its famous undulating mosaic bench with its panoramic view, the garden of the lavenderere and of course the access to the rest of the park and the Calvary at the top of the hill.. The visit of the Sagrada Familia and its towers: Also a skip the line entrance ticket for the visit of the Sagrada Familia, Gaudí's masterpiece. Enjoy the comments in the audio guide and enjoy the panoramic view from the top of one of the towers. Barcelona Tourist Bus : Visit the city's main attractions with Barcelona's official tourist bus. Get on or off at over 45 different stops including Parc Guell. Enjoy an audio guide on board to learn the history of Barcelona. Transfer from the Airport : The Barcelona City Pass includes airport transfer to the city centre (round trip) by Airbus or a one-way ticket from Girona airport. 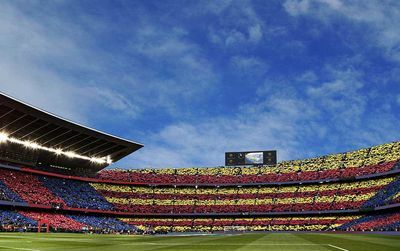 And 20% discount for many other monuments in Barcelona : Take advantage of 20% discount on tickets to a large number of attractions, such as Casa Milà, Casa Battló or the visit to Camp Nou, as well as on excursions to the Costa Brava or Montserrat. 2/ The combined ticket: Visit of the Park Güell skip the line ticket + Tourist Bus one day. A very ingenious and economical combined ticket that offers a whole day to discover the city on a sightseeing bus and priority access to the Park Güell. Convenient because the bus (blue route) drops you off near the Parc Güell ! Forget the complexities of getting there by public transport! Enjoy the 3 roads and 45 stops in front of the main landmarks of the city. You get on and off the bus as often as you want, at your own pace. Access to the three routes of the official tourist bus service and its free audio guide, during a whole day. You can get on and off at the 45 stops located near the city's most visited tourist attractions. An audio guide (in English or 15 other languages) and headphones available onboard the bus..
A map and guide of the city, available in different languages. Coupons, with a total value of 250€. Blue line bus stop near Parc Guell. The access to the so-called "monumental" area built by Antoni Gaudí: the modernist pavilions the entrance and the Guard's house, the Monumental Staircase, the 86 inclined columns of the Hall, the gardens of Austria, the Nature Square and its famous undulating mosaic bench with its panoramic view, the garden of the washerwoman and of course the access to the rest of the park and the Calvary at the top of the hill. Priority entrance to Park Güell - No time wasted! Access to the so-called "monumental" area built by Antoni Gaudí where you can visit: the modernist pavilions, the entrance and the Guard's house, the Monumental Staircase, the Hypostyle Hall with its 86 inclined columns, the Austrian gardens, the Nature Square and its famous undulating mosaic bench with its panoramic view, the lavender's garden and, of course, access to the rest of the park and the Calvary at the top of the hill. 4/ The guided tour of the Park Güell with an English guide + priority entrance ! 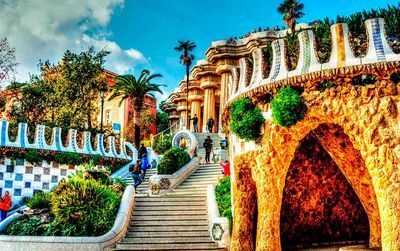 Ideal to understand all the subtilities of the Park Güell, the visit is made in limited number with a guide speaking English. We learn the history of its construction, its many vicissitudes which led to its abandonment before its end. We can also better understand Antoni Gaudí's vision, his relationship with nature, the hidden meaning of his work, his deep belief, the techniques of modernism such as the trencadis (the mosaic) and above all his poetic conception of architecture and avant-garde of the urban ideal. Don't forget that it is a garden city, a concept to render life in the city more enjoyable and functional. A guided tour of the Park Güell with an English guide and only for small groups. Explanations animated by your guide on the exceptional architecture made by Gaudí in order to understand the symbols hidden behind this work. Discover the famous Salamander located on the stairs of the Dragon of the Park Güell, its water games, its fountains, his already ecological system of water recovery. Enjoy the spectacular view of Barcelona from the Nature Square. The guided tour lasts about 1 hour and 30 minutes, but you can stay in the park as long as you wish. It is advisable to arrive more than one hour before the official closing time of the Gaudí Park, because the last authorized entrance is one hour before the closing time. Take your time, it takes at least two hours to enjoy the site. Where is Park Güell ? There are three entrance points: Carrer de Larrard (main entrance), Carretera del Carmel, number 23 and Passatge de Sant Josep de la Muntanya accessed by escalators. How to get to Park Güell ? The tourist bus (blue route), which we mentioned in two of our packages, will drop you off just a stone's throw from Parc Guell, which is great. The stop is on the Travessera de Dalt at a 10 minute walk and it is recommended to reach it by the Carrer de Larrard (main entrance). Park Guell by bus: Bus 24 leaves from Plaça Catalunya and leaves you not far from the park. The other bus lines are H6, 32 and 92. Park Guell Metro : get off at Lesseps L3 or Vallcarca L3 metro stations and walk about 20 minutes. The Vallcarca station is located at the summit of the park where you will only have to go down towards the main entrance. The Lesseps station is located at the bottom of the Park, so you will have to climb using escalators. By taxi, it is very practical and fast but a little expensive. From the city center count 13-16 euros the race. Same price for the return. There is a taxi stand at the main entrance. Parc Guell, Parc of Guell or Park Güell: the right spelling ? The main entrance is via Carrer d'Olot. The two modernist pavilions hosted the administration of the residence and the security service. Today they are souvenir shops. Park Güell Map: the fee-based area, the free area, the different entrances. Gaudí lived until the end of his life in this house which became a museum (Casa-Museu Gaudí). You can visit it to discover an exhibition of furniture designed by Gaudí for the Batlló and Calvet houses and on the first floor for the artist's office and bedroom. Attention however this visit is not free, and is not included in any of the packages we offer. Generally the visitor buys the ticket on the spot. The museum is very small and often crowded. It's up to you once you get there. The entrance ticket costs 5,50€. At the main entrance, in front of you, you will find the monumental staircase composed of several stairs and fountains, the most famous is shaped like a mosaic salamander, symbol of the city. The Sala Hipóstila, composed of 86 six-metre high columns, was to serve as a market and alludes to a forest. On the ceiling of this room, circles of mosaics represent the four seasons and the lunar cycles. The Place de la Nature, a kind of ancient agora, is the most emblematic part of the park. Its long mosaic bench and one of the most photographed monuments in Barcelona. Gaudi used more than anywhere else the technique of the "trencadis" which consisted in reusing fragments of recycled ceramics to make new decorative motifs, typical of Catalan modernist architecture. The Plaza de la Nación offers a beautiful panoramic view of Barcelona. A short walk through the park will take you to the Austrian gardens, a viaduct and the Calvary, the highest point on the hill. A shop where you can buy souvenirs of the Guell Park and Antoni Gaudí's work. These are derived products such as postcards, posters, t-shirts but also jewellery and costume jewellery, decorative objects, reproductions and specialised books on Gaudí, Modernisme (Catalan Art Nouveau) and Barcelona. This shop is located in one of the entrance pavilions of Park Güell. To prepare your visit and find all the information on the history of the Park Güell and its architect Antoni Gaudí. Can I buy tickets to visit Park Güell at the entrance of the Park ? Yes you can buy admission tickets at the Park ticket offices. The price of the general admission ticket is then 8,50€. It is therefore more expensive than our offer because the official organizers prefer to book online at a fixed date and time for obvious reasons of fluidity of visits. You have understood it, only one advice: booking online in advance. Visit Parc Guell for free ? The monumental zone is freely accessible before 7:45a.m. and after the official park closing time. So you can enjoy it early in the morning or late for sunset or at night even if it's already dark. The rest of the park (17 hectares) is free of charge. Barcelona's citizens often take the opportunity to picnic, run or go for walks. For photographers, the top of this free area offers a beautiful view over the city. Children under 14 not accompanied by an adult under their care are not allowed to enter. Don't panic, we don't ask you for your papers at the entrance but don't imagine leaving children under 14 visiting the Park on their own. There is a specific itinerary adapted for people with reduced mobility in Parc Guell. However, due to the architectural features of the Park, with its irregular staircases and paths, people with reduced mobility may have difficulty moving around the monumental area or monumental centre. Wheelchairs are available from park staff upon request. What is the average length of the park Guell visit? The average length of a visit to Park Güell is about one hour if you do not take the time to stroll. Visitors are advised to wear comfortable shoes and to protect themselves from the sun, especially in summer. Remember to bring a bottle of water as there are no drinking water fountains along the route. What are the rules when visiting the Park Güell? Be vigilant about the times of admission tickets purchased in advance. They allow you to enter the Park during the 30 minutes after the reserved time slot - no more. You must keep the entrance during your visit to Park Güell and show it to authorised personnel if requested. Any exit from the paying zone is definitive. Once the entry has been validated at an access control point of the Monumental Centre, you cannot leave this paid zone and then return to it. Since a visit date and time must be reserved, Parc Guell will not refund any tickets in the event of a cancellation. Visiting Barcelona without going to park guell would be a heresy! Be aware that there are other lovers of beautiful things, even if it is obvious, I advise you to book your ticket in advance. Once booked, this park is simply wonderful! A great memory. Any the tickets for the Champions League? All tickets we sell on this page are skip the line tickets (you will have to choose the date and time of your visit). The number of visitors being limited, the visit of the park itself is very fluid and pleasant. do we have to wait a long time, even with our tickets? Yes, there are discounts for child. Follow your booking process and you'll see that Child (4-12) pay €21 (and not 37€) for this combined ticket - bus hop on hop off + skip the line entrance for Park Guell. Any reduction for my son of 6 for the bus hop-on hop off + Park entrance? Oui Anne on peut acheter son billet d'entrée sur place, le prix est un peu plus élevé qu'en ligne et il faut vous attendre selon les moments à des files d'attentes. La billetterie du Parc Guell est indiquée sur la plan dans cette page. Peut-on se procurer les entrées à un guichet sur place ?